On a beautiful and clear Friday evening I met Aaron an instructor with Windy City Flyers at their Palwaukee Airport offices. 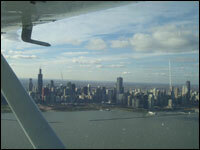 We briefly reviewed my Chicago sectional and my newly purchased Chicago VFR terminal area chart. On the sectional Aaron showed me all the best airports in the Northern Illinois and Southern Wisconsin area. He was sure to point out the best airport based restaurants as well. After that we looked at the terminal area chart for Chicago which shows the Chicago area in greater detail. On the terminal area chart we looked closely at the Chicago O'Hare Airspace. We decided we would fly down the Chicago skyline so we looked at how we could accomplish this flight while staying below O'Hare airspace. Next we went out to the Cessna 172 Skyhawk SP. This was the nicest plan I have flown to date. It was relatively new, well maintained and even had some nice equipment including GPS navigation. Shortly after completing the preflight of the plane we departed on runway 34, Palwaukees longest runway. Of course flying the Skyhawk we were airborne shortly after starting our takeoff run. As we turned east towards Lake Michigan we had a great view of the Chicago skyline to our south. We climbed up to 2,500 feet which gave us 500 feet above us before we would cross through the floor of the O'Hare airspace. After a few minutes we were over the lake and I turned us south towards the city. It was great flying over Northwestern University, Wrigley Field, and Navy Pier on our way to the city. The view of the city from a small plane at 2,500 feet was beautiful. I loved looking out the window to see the Chicago River winding through the city. Next we flew over what used to be Meigs field. You can still clearly make out where the runway used to be. I wish Meigs was still active. We then decided to head down to the Gary International Airport for a touch and go. With a stiff cross wind I was blown outside of the optimal flight path through the pattern but ended up making a decent landing. Though you could tell it had been a few weeks since I had flown last. After a touch and go we headed north past Chicago and back to Palwaukee airport. I logged a very memorable 1.4 hours that night. I am excited to get back up soon to explore more of the Chicago area from the skies. Glad your first Chicago flight was a memorable one; I've always loved making that scenic lakeshore run, but my typical path was opposite yours -- south to north first -- since I'd usually get going out of Midway. I'll be curious to see what your observations are about working _within_ Midway's moderately GA-friendly Class C airspace should you ever take that planned flight from the Southside. Nice pictures. I still haven't made that flight, I'm not sure why. Did you get flight following along the way?